Black Charlottesville beating victim charged with felony at prompting of white nationalists. 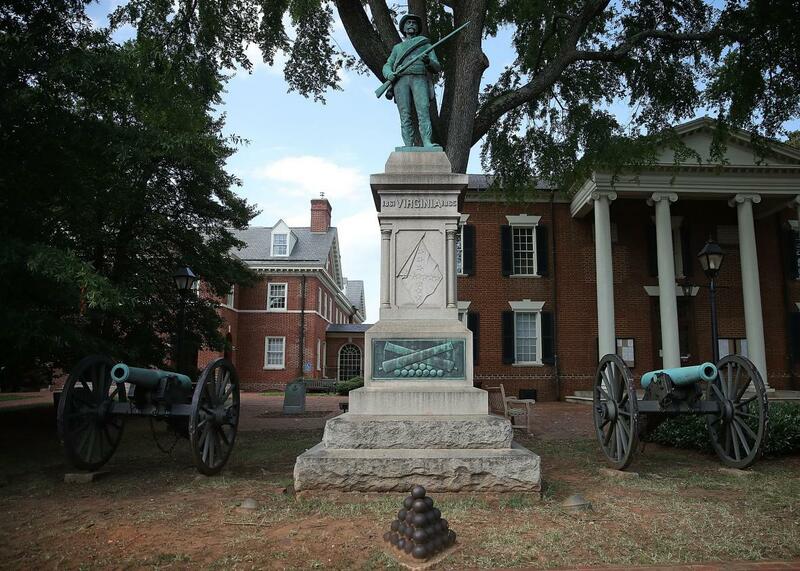 A confederate statue in front of Charlottesville, Virginia’s Albemarle County Courthouse where these sorts of decisions get made. Neo-confederates helped orchestrate the arrest of a black man who was badly beaten by white supremacists during clashes in Charlottesville, Virginia, earlier this year. DeAndre Harris was charged on Monday with felony unlawful wounding for his role in an altercation with a “Southern nationalist” in August. The arrest warrant was issued by a city magistrate prior to a full police investigation at the prompting of white nationalists after a successful social media campaign had helped bring about the arrest of some of the men who had attacked Harris. The beating of Harris was caught on video, which prompted that campaign. According to Harris’ attorney, he suffered injuries that included a head laceration requiring staples, a knee injury, and a fractured wrist. On Tuesday, a third man was arrested in connection with the attack, Jacob Goodwin of Arkansas. Goodwin was reportedly wearing military tactical gear, a pin for a white nationalist group called the Traditionalist Worker Party, and another pin with a code for “Heil Hitler” on it during the attack. Dan Borden was charged with malicious wounding in August in the incident. ABC News affiliate WCPO reported that Borden had previously been charged with possessing a deadly weapon in a school safety zone, aggravated menacing, and disorderly conduct. Former classmates told the network that he had used anti-Semitic slurs, drawn swastikas, and pulled a knife on a classmate. Alex Michael Ramos was also arrested on one count of malicious wounding shortly after Borden’s arrest. Journalist Shaun King has led the campaign to identify the men who took part in the attack and recently increased a bounty for an identification of the last suspects to $50,000. But now Harris is facing the same charges as some of his attackers in a move that was prompted directly by the activism of white nationalists, and a move that his lawyer is describing as retaliatory. Prior to being assaulted, Harris was involved in an altercation with Harold Ray Crews, chairman of the League of the South’s North Carolina chapter. Harris was charged after Crews and his group obtained an arrest warrant from a magistrate judge because they were “sick of waiting” for police action, according to a representative from the League of the South, a neo-confederate group that advocates secession and “Anglo-Celtic” rule. Charlottesville police Sgt. Jake Via said that Crews had “jumped the gun” by obtaining a warrant before a police investigation was complete. Harris’ lawyer, S. Lee Merritt, says the video does not justify the charges that have been issued. Harris’ attorney also noted on social media that there is separate footage of white men attacking Crews and striking him in the head. “If he sustained injuries, I imagine he sustained injuries during the second attack and not the first,” Merritt told me. Merritt says he has not yet received a copy of the warrant for Harris’ arrest, so he is unsure of the name of the the magistrate who issued it. He has arranged with local officials for Harris to surrender of his own recognizance within the next week. It will then be up to Commonwealth’s Attorney Dave Chapman to decide whether or not to go ahead with the case.